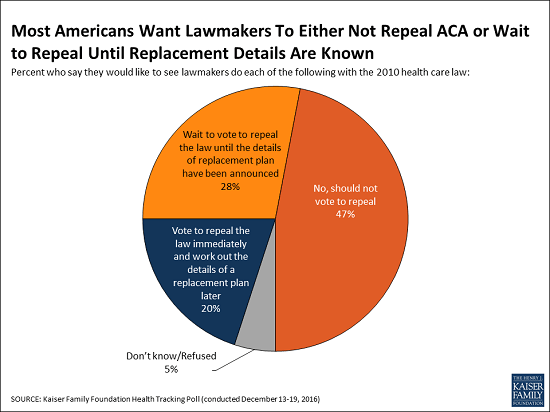 As Congress begins to work on repealing and replacing the Affordable Care Act, the latest Kaiser Health Tracking Poll finds that one in five Americans (20%) support repeal alone, while three quarters either oppose repeal altogether (47%) or want to wait to repeal the law until the replacement plan’s details are known (28%). Overall, the poll finds that nearly equal shares say that the next Congress should vote to repeal the law (49%) and that it should not vote to repeal it (47%), which mirrors the public’s overall views of the 2010 law (46% view it unfavorably, 43% favorably). The debate surrounding repeal could influence the public’s views, as the poll finds that some people shift their opinions after hearing counter-arguments. For example, after hearing pro-repeal arguments about the law’s costs to individuals and the government, the share of the public supporting repeal grows as large as 60 percent, while anti-repeal arguments about people losing coverage and the impact on people with pre-existing conditions decreases support for repeal to as low as 27 percent. When asked directly about their family’s health care costs, similar shares of the public say repealing the Affordable Care Act would make their situation worse (28%) as say it would make it better (27%). Most say their own ability to get and keep health insurance (55%) and the quality of their own health care (57%) will stay about the same if Congress votes to repeal the law. The public ranks health care as a top issue for President-elect Trump and the new Congress to address this year. About one in five (19%) name health care when asked an open-ended question about their top issue for 2017, behind jobs and the economy (24%) and similar to immigration (20%). Fewer cite education (7%) or foreign policy (7%) issues. Among health care priorities, repealing Obamacare ranks well behind several other health-care issues that Americans want the next administration to work on with majorities of the public more directly focused on what consumers pay for their health care. 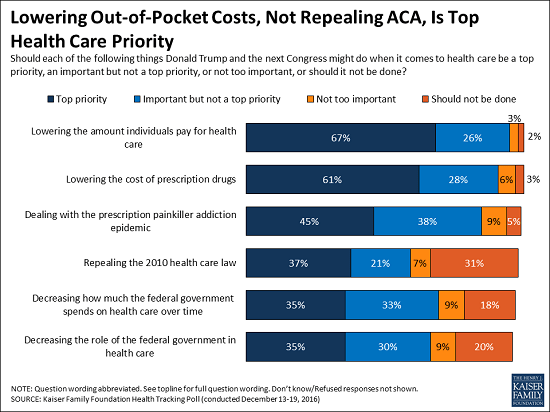 When asked about a series of health care priorities, two-thirds of the public (67%) say lowering the amount individuals pay for health care should be a “top priority” for President-elect Trump and the next Congress. Similar shares of Democrats, Republicans and independents name this as a top priority. Nearly as many (61%) say lowering the cost of prescription drugs should be a “top priority,” while smaller shares say so about dealing with the prescription pain killer addiction epidemic (45%), repealing the 2010 health care law (37%), decreasing how much the federal government spends on health care over time (35%), and decreasing the role of the federal government in health care (35%). Some of these issues rank lower in part because of sharp partisan divisions over their importance, most notably when it comes to repealing Affordable Care Act. About six in 10 Republicans (63%) name repeal as a top priority, compared to a third of independents (32%) and a fifth of Democrats (21%). There are partisan differences, with about half of Republicans (53%) preferring the approach that Republican leaders have coalesced around – limiting federal health spending, decreasing the federal government’s role, and giving states and individuals more control. The majority of Democrats (79%) and independents (65%) prefer guaranteeing a certain level of coverage for seniors and lower-income Americans – even if it means a larger role for the federal government and increased federal spending. Designed and analyzed by public opinion researchers at the Kaiser Family Foundation, the poll was conducted from December 13-19 among a nationally representative random digit dial telephone sample of 1,204 adults. Interviews were conducted in English and Spanish by landline (421) and cell phone (783). The margin of sampling error is plus or minus 3 percentage points for the full sample. For results based on subgroups, the margin of sampling error may be higher.